Members of the international advisory board of the Irish Chancery Project pictured at the final meeting held on 13 May 2011 in Trinity College, Dublin. 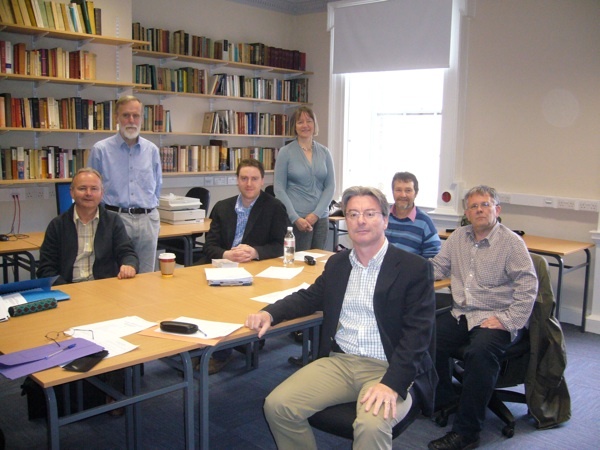 Back row (L-R): Prof. Sean Duffy (TCD); Prof. Robin Frame (Durham); Dr Peter Crooks (TCD); Dr Elizabeth Matthew (Reading); Prof. Chris Given-Wilson (St Andrews). Front row (L-R): Dr Brendan Smith (Bristol) Dr David Ditchburn (TCD). Trinity has over twenty full-time members of the academic staff who contribute to the activities of the Medieval History Research Centre and a wide network of scholars and collaborators in institutions inside and outside Ireland. Last updated 28 January 2019 medieval.history@tcd.ie (Email).